Welcome to the new Webroot Community! Introducing the brand-new Webroot Community! So much has changed yet so much remains the same. Our mission is to provide a virtual meeting space where Webroot users and cybersecurity enthusiasts can learn, share, and connect. With the launch of our improved community, the Webroot Community Team and I will be able to do this even better. If you already have a Webroot Community account, click here. If you’re new and haven’t created a Webroot Community account, click here. Double check that your profile and signature are setup how you want it. Subscribe to the categories/sub-forums. Simply click on the subscription button in the upper-right corner of each sub-forum. Click around the new community. If you notice any issues or come up with a problem, let us know! We will be updating our Getting Started Guide constantly with helpful tutorials, instructions, tips, and more to ensure that you hit the ground running. Be sure to bookmark or subscribe to this article to stay up to date. We’re so happy that you’re here to continue this journey with us that started over 7 years ago. If you have any questions about the new community, please don’t hesitate to ask the team via a private message or post your question here. Congratulations on your launch of the new Webroot Community. Also, I miss Notification Feed, which was a page which notified you of any new replies to threads in which you are participating (as well as any kudos you have received). That was a very useful page. Is it possible with inSided? Congratulations on the launching of the new community!! If I may ask, what happens to the beta program we joined previously. They do not seem to be listed anymore. I asked about that on the closed forum. Webroot is rebuilding the beta forums at this time for the new forum. Give them a little time to get it all together for this forum. I find this new forum software tormenting/excruciating at best. IMO it's like looking through binoculars from the wrong end. Nice new look, but like anything new, it will take some time to get used to its little issues. For one thing, it has a LOT of empty or wasted space, and sadly, I do not like the mobile version at all. And where did the Beta forum go? And I used to be listed as a "Community Guide", and now I am listed as a Popular Voice. What changed? The Beta groups need to be rebuilt and I'm not sure of the reason but maybe @LLiddell can add more. They can also fix your account back to Community Guide and Lara will see this. Knowledge Base articles coming back ? Yes, the KB articles are on the site but we are working to make accessing them much easier. They're kind of scattered, we're working to bring them all into one section so it makes more sense. Should look similar to the Malware Manifesto part of the site, basically all of them will have one home and we will provide a breakdown of different products so it's easier to hunt them down within that new home. - Owen Rubin, IT & Security Consulting. This is my story and I'm sticking to it! Another apparent little bug to be ironed out (unless I am missing something? ): after posting I can go on to edit my post but then, I can find no way to post what I have edited! I'm stumped! How does one post an edit? It seems some others have cracked this. I haven't. We can put in a request for what you are describing, however the current standing is however inSided has designed it. We control very little when it comes to features as mentioned above. It would great to add a feature like what I suggested. However, I understand if it isn't possible. I develop user interfaces and sites, so I understand that some features just aren't possible to get into the design. Especially if someone else is the designer, and it sounds like someone else is behind the design. Not that you don't have input, but you have to pay the bill for them to make changes. Those bills usually aren't cheap either. Good luck, and if you need any suggestions, feel free to message me. I do really appreciate the insight though, and it is possible to use the email notification in lieu of a dedicated notification page. As for now that is the method we are using, along with subscribing to sections of the Community you find to be most valuable. I will add a plus 1 for NicCrocket's alert notification idea as their are days where I see way too many alerts in my inbox, which is already flooded with emails anyway. I appreciate you passing on the request. But I'll add one more: Alerts on some schedule (like 30 minutes, hourly, daily, etc) so that a number of them are put together as a list into a single email. At least that could cut down the number of emails. All 3 links in Sherry's post (2 years ago) bring me back to the Community "Home Page"
All three of the links that @ProTruckDriver posted follow the same rules that I posted in my last post. Oh you're right, ok, I'll submit a ticket into support with inSided. Those should successfully redirect. Seems to be working ok for myself, maybe I'm missing something. above links land on https://community.webroot.com/#M27761 for me. Right, I made a ticket with support so we can figure out what's going on there. https://community.webroot.com/ - The main domain. t5/ - I believe this was an id for the specific forum in the community. 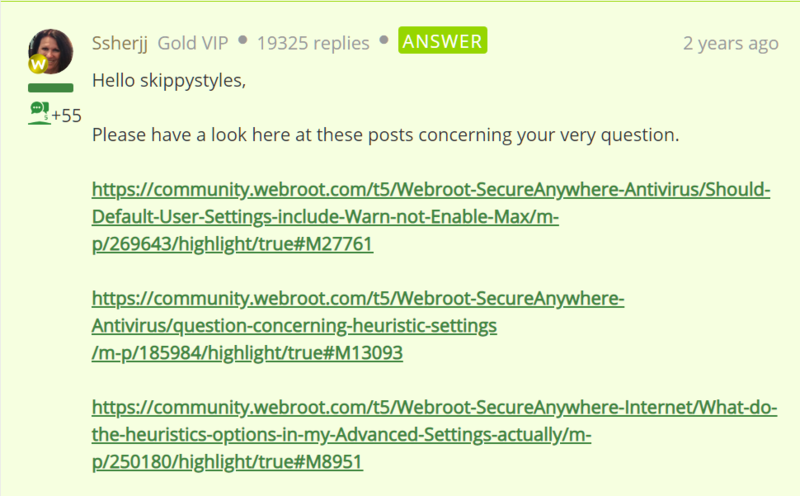 Webroot-SecureAnywhere-Antivirus/ - This is the name of the specific forum in the community. Should-Default-User-Settings-Include-Warn-not-Enable-Max/ - Name user gave thread when it was created. m-p/ - I'm not sure what this is referencing. 269643/ - Id given to thread by forum when thread was created. highlight/ - I'm not sure what this is referencing, but I believe it told the community to highlight a specific post in the thread. true#M27761 - I believe this also is what told the community to highlight a specific post. In this case, it was either post M27761 or 27761. I reviewed this post in the new community and there isn't a post with the number in my last point. I'm guessing the new community renumbered the reply posts. If I'm correct, you're going to find it very difficult to reestablish these links. If you can't reestablish these links, you might try an auto redirect that removes the /highlight/true#M123456. You'll have to accommodate for at 4 and 5 digits after the M, maybe more and less. In the examples given above, I can see at least those two variations. I will admit that this is a bad solution because these links pointed users to specific answers to their problems. By redirecting to the main thread, you lose that information making it harder for your users to find what they need. I would only use this as a last resort. really good job ! now why not some overhaul on the ws gui ?